Fur chewing is a behavioural disorder among Chins. While the potential causes may be varied and indeterminant [see next section, "Causes"] , its appearance is fairly consistent among afflicted individuals. The chewed fur areas are typically located about the haunches, legs, and, in many cases, the tail. The fur itself will be very short as the bar, if any, and fur tips will be cropped. Among Standard Greys and Black Velvets, the slate grey underfur will be exposed. With other colours such as Wilson White and Tower Beige, a dramatic colour change will not be evident as the entire fur strand is already coloured white and beige, respectively. Fur chewing cannot be confused with other fur ailments such as Fur Fungus [aka Ringworm] or metabolic/nutritional disorders as there will be no bald patches. In contrast, Fur Fungus will be characterized by bald patches with red dots or areas on the skin itself and often begins about the side of the face. Baldness due to metabolic/nutritional disorders will look similar to fur fungus except that the skin will have normal pigmentation, it typically begins at the rump, and the Chin will be severely underweight. Quoia, a Black Velvet, is a particularly striking example because he shows a dramatic colour change on the dorsal surface from the normal jet black of the fur tips to the slate grey of the underfur. Ranchers are usually of the opinion that fur chewing is a compulsive disorder that is the result of a genetic disorder/mutation and that entire lineages must be removed from breeding to eliminate the problem. However, attributing fur biting to genetics is simplistic at best. It is like attributing a direct genetic cause for, for instance, nail biting in humans when in fact the behaviour is a learned expression of underlying personality traits and stress coping mechanisms. Behaviours are the result of a complex interaction between environmental and hereditary factors and determining the relative contribution of each is exceeding difficult for complex behaviours. However, it is becoming apparent that fur chewing may merely be just one of many stereotypies [repetitive behaviors in caged animals] common to many animals [ie., jumping, pacing, somersaulting, bar-biting, and occasionally self-mutilation] and are a result of such factors as stress, anxiety, boredom, loneliness, mental illness, etc. These, in turn, may arise from such situations as isolation, lack of a Chin companion, environmental disturbances, infrequent dust baths, monotonous diet, poor housing, etc. Consequently, if allowed to continue, these behavioural patterns may become quite ingrained, resistant to change, and possibly even more compulsive and bizarre. In extreme cases, self-mutilation such as tail-chasing and tail-biting may result. These behaviours can be learned via observation and imitation [ie., from cagemates or neighbours] OR develop in isolation. Any apparent genetic component would seem to reside in a particular animal's ability to cope with stress rather than in any specific behaviour pattern. Many overlook the possibility that it is actually the Chin's cagemate that is doing the fur-chewing. You will need to either observe firsthand who is actually doing the chewing ["catch him/her in the act"] or remove the cagemate for a several weeks and observe whether the fur-chewing continues. Fur-chewing due to nutritional deficiency is considered quite unlikely but the MCBA has published some evidence linking fur chewing to a deficiency in sulphate amino acids. However, this avenue remains inconclusive. c) behavioural training [ie., using classical and/or operant conditioning techniques]. Fur-chewing due to stress such as from disruptive animals [ie., barking dogs, lurking cats, screeching birds, or even persistent/aggressive cagemates] , traumatic life events [ie., loss of a mate, move to a new home] , or improper environment [too small a cage, etc] should be controllable by the provision of a quieter, less stressful environment and sufficient activity, etc, as above. Fur-chewing due to genetic predisposition is not normally cureable but triggers such as stress, etc can be minimized. The maintenance of a stable environment would fall into this situation. In the more resistant cases, medication may be effective. ChinMom chinmom@earthlink.net has reported in the past some success with tranquilizers and mood modifiers such as paxil and valium. Persistent fur-chewing may lead to the development of furballs in the Chin's digestive system. ChinLady chinlady2000@aol.com suggests that one can use Laxatone or Laxaire to prevent intestinal fur blockages. Since Chins love the taste of it, you can simply put it on their paws or just let them lick the stuff off your fingers or a tongue depressor. Others provide regular doses of papaya enzyme for the same purpose. Although fur-chewing due to nutritional deficiency is considered quite unlikely, it would be best alleviated by the provision of a proper diet and decreasing the amount of treats. 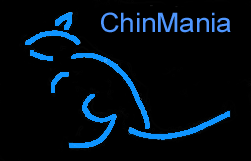 Refer to the ChinMania Chin Diet for suggestions and guidelines. � 1999-2007 ChinMania & AniMania The concept, design, and all content of ChinMania, the Chin Colour Calculator, the Chin Colour Crosses, the Chin Owners Directory, as well as the terms "ChinMania", "Chinmania", "chinmania", "Chin Mania", "Chin mania", "chin mania", "ChinManiac", "Chinmaniac", "chinmaniac", "Chin Maniac", "Chin maniac", "chin maniac", and any derivations thereof, is copyrighted by ChinMania and AniMania ( � 1999-2007 ChinMania & AniMania ) and may not be used without the express written permission of ChinMania and AniMania. All photos on this page are copyrighted ( � 1999-2007 ) by the respective contributors and are used here with their express permission.